SimpleCoat Selective Conformal Coating System. SimpleCoat is ideal for selective conformal coating and dispensing applications that require a high level of accuracy and repeatability. It is an ideal solution for medium and low volume. SimpleCoat is equipped with a robust 3-axis motion platform that, in the base configuration, includes a spray valve and a needle valve. An optional volumetric pump may be used in place of the needle valve. For Tilt-and-Rotate capability, refer to the SimpleCoat TR. SimpleCoat software works via a customer-supplied laptop computer. Programming is easy and can be done either by manually teaching a program or by using a JPG image of a PCB. 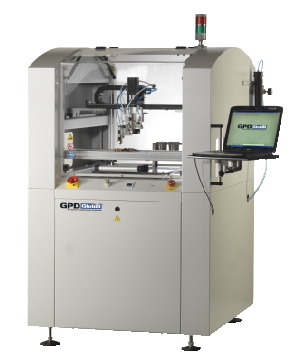 All dispense and motion parameters can be easily altered with the easy-to-use interface. Various shapes, patterns, and areas can also be programmed. Demonstration of HumiSeal 1B31 Spray and Dispense Process on SimpleCoat - video.